To celebrate Barry Sheene’s 40th anniversary since winning the 1976 and 1977 500cc Motorcycle World Championships, Stephanie, Barry’s wife, and Freddie, Barry’s son decided to commission a leading motorsport artist to create a one off, bespoke collection to celebrate these two historical milestones. After reviewing over 15 potential artists, the Sheene family decided to commission world renowned motorsport artist Jonathan Carter to create an eight-piece Barry Sheene collection. Over the course of 2016 and the start of 2017 the family worked closely with Joff to initially identify the eight pieces that would form the collection. Over a nine-month period Jonathan created the bespoke collection with regular input from the family. The collection was finished in May 2017. 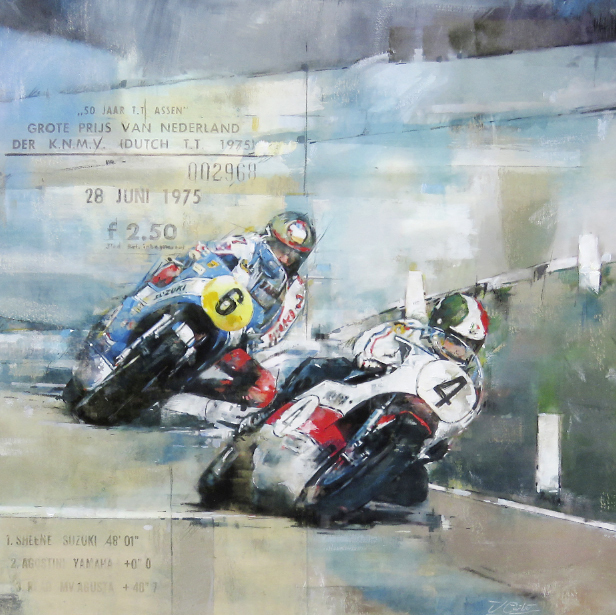 The frames of all eight paintings have been signed by Freddie Sheene to ensure authenticity. This picture represents Barry’s first ever 500cc race victory in 1975 – before he rode under his famous lucky 7 – at the Dutch TT at Assen in front of a record crowd of 140,000. Trailing behind Giacomo Agostini at the last corner Sheene blasted past the Italian’s Yamaha to win by half a machine’s length in the 200 yard run to the flag.